The questioner here also asks regarding the fighting in Syria and its ruling. Firstly: That it it obligatory upon each Muslim, the Monotheist (al-Muwahhid) that he supplicates to Allaah for his brothers, the Muslims in every land of the World, and from them, the land of Syria in specific – that he calls upon Allaah, the Most High, whilst in prayer or whilst upon his travels, or during those times when the supplications are more likely to be accepted, that Allaah relieves them of that which has afflicted them from harm, and that He lifts from them that which has afflicted them from tribulations, and that he protects us and them from evils and trials – and that He has mercy upon their old, their young, their womenfolk and their youth. That we ask that Allaah aids the weak and downtrodden in every place. There is no doubt that which has afflicted them is a mighty affair – and that which they face from killing, annihilation, plundering and pillaging, then no doubt it is a mighty and tremendous matter. So we ask Allaah, the Mighty, The Lord of the Mighty Throne, from His Bounty and Kindness, from His Power and Might, that he lifts from them that which has afflicted them from trials and harm – and that He aids the supports the weak and downtrodden from Ahlus-Sunnah in every place, for indeed He is the Most Generous, the Most Kind. So that is the first point. 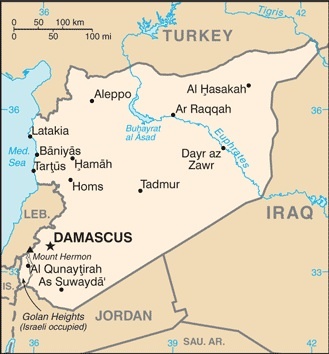 As for the second affair: When there occurred that which occurred in the land of Syria of revolt by some of the people in the beginning against that oppressive, tyrannical, transgressing ruler, and Allaah’s refuge is sought, and they stood against him and some of them took up arms against him, the people of truth of that land came asking, seeking the truth as to what they are to do. So the true Scholars of Ahlus-Sunnah answered without any flattery and without seeking any benefit for themselves as is sought by others who pursue and seek after tribulations (fitnah). So the Scholars issued fatawa in truth and in the light of the Prophetic narrations, that you should not do that (i.e. rise up against the ruler), and not raise weapons, and that you must stay away from tribulation and trials. And that is not due to the fact that the ruler is not a sinner, a criminal, and not due to any sanctity of Islaam for him, no! Rather from the conditions of Ahlus-Sunnah as it relates to revolt against the ruler who is an unbeliever and upon whom the ruling of disbelief has been confirmed with utter certainty and with proof from Allaah – so the Scholars have mentioned conditions – and that is even for the disbelieving ruler whose disbelief has exited him from the Religion, due to the fact that it is clear cut open disbelief – the disbelief which we see, which is open and apparent, for which we have a clear textual proof from Allaah. So this one who is revolted against, that the revolt against him must not lead to greater tribulation than what was already present before, greater destruction than what was there before. So if by removing this ruler, it leads to even greater harm and corruption, then it is not permitted to raise arms and weapons against such a ruler – and this is by the agreement or consensus (ijmaa’) of the scholars. So there must be ability present before he can be removed. So if there is not present the ability to remove him, then likewise he cannot be revolted against and removed. So this is what the Scholars gave as verdicts (fatawa) in this affair – that it is not permitted to rise up in arms against that ruler [of Syria]. As for the opportunists who have little regard for principles, the people of desires and and innovation (Ahlul-Bid’ah), those who profiteer behind the scenes when tribulations take place, and when blood is shed – these people say: “Look! They are defending such-and-such [a ruler]!” However, the Scholars of Sunnah do not defend this tyrannical sinner. Rather their intent is to protect the blood of the Muslims, the weak and downtrodden from the viewpoint and insight of the Sharee’ah, which is pure and purifies. So upon you is to look and see: When the affair became great and then increased further over these past three years, that this criminal day by day has only increased in his criminality. He has slaughtered men in their hundreds, in their thousands, and tens of thousands. He has done the same with children, and the worshippers, and the land itself, he has destroyed homes, yet he has still not left his seat of power. So by seeking his removal, what has been achieved? The corruption that was there before of killing has now multiplied and multiplied. Rather, he has now called out and sought aid from the Raafidah, the worst filth of the people. So they came and they began to aid the ruler with falsehood upon falsehood – and we ask Allaah for security and well-being. And the Scholars of Sunnah are not harmed by those antagonists, the opposers of the truth, those who do business with the blood of people, just as they did business with the blood of the people in Iraq, and just as they did in other than Iraq from the lands of Allaah. They did not aid Islaam, nor did they break the enemy! They do not speak with the Sharee’ah of the Prophet (salallaahu ‘alaihi wassallam). They are the most ignorant of the people concerning the Religion of Allaah. They are greatest liars amongst the people concerning the Sharee’ah of Allaah. So there must be Ruler, a banner that is true, sound, just, free from chaos and disorder and so on. Yes, a correct banner behind a legitimate ruler, as the Prophet (salallaahu ‘alaihi wassallam) said: “The Ruler is a shield, and the fighting takes place under his leadership.” Meaning that he is a protection for them, so the Ruler is a necessary component – it cannot be the case that a few people gather together and say, “Ok, you, me and so-and-so, so we’ll appoint you as our Ruler.” This is playing games, and a fabrication against the Sharee’ah, it is a mockery of the Religion of Allaah. There are many now who are trading and doing business in this crisis. The people of desires have caused great confusion in this affair by way of the internet and other social media. Fitnah (tribulation) is like fire, it requires wood and fuel. So who the fuel of for this tribulation? It is not possible that the fuel of this fitnah are only the youth of this Ummah who are trying to seek out the truth – however, they are not guided to those who will take them by their hand to show them what is correct. So these youth are traded by those who do business in blood – they hurl them into this tribulation making them fuel for the fire. They cause mischief with their minds saying to them, “There is nothing between you and Paradise except this [war in Syria], so you should do such-and-such an act [of violence].” It is made to seem that Paradise is in front of them, and the gate to Paradise is with them (i.e. the callers to fighting in Syria) and that they have the keys to it! So this crisis, may Allaah bless you, as we have stated, many are trading in it, causing confusion and chaos amongst the people, making mischief whilst continually reviling what the the Scholars of the Sunnah are upon – they are pleased with atrocities taking place. Some of them declare other Muslims to be unbelievers, and they accuse others to be heretics, and they make permissible the spilling of the blood of many people. My brothers, happiness is for the one who accepts admonition from another. There are those who returned from that land (of Syria) who narrate the mentioned the conditions there – people who are trading with the lives of the youth. They ask them, “From which direction did you enter the land? For this direction or that direction?” This is just the same as what occurred in Iraq – when some of the youth went to Iraq in the name of “Jihad” and “fighting”, they would buy and sell them, either for the wicked Raafidhah or other enemies of the Religion. So they fell prey to these traders [in human blood]. And they would do this to others coming from various lands. So I ask this banner, therefore, that is being raised high by these various warring factions, do you not see them fighting, slaughtering and killing each other? They are killing each other! All in the name of “Jihad”! They give a bad image to this this noble term, this act of worship, this clean and pure term. It is disfigured by the deeds of many – those who are ignorant of the Religion of Allaah. And it is possible that some of them even know they are upon falsehood, but they make judgements based upon their own desires, whilst others are ignorant, and refuge is sought with Allaah – or it may be a combination of both of these ills. So the tribulations took place and they increased and multiplied and spread to many lands, and maybe even to this land. So for this reason a group of the Scholars issued verdicts (Fatawa), the Scholars of the Sunnah, the Scholars of the Truth [whose concern is the Truth], such as the ‘Allaamah ash-Shaikh Saalih al-Fawzaan and other than him from the Scholars of Sunnah such as Shaikh ‘Abdul-Muhsin al-Abbaad, Shaikh ‘Ubaid a-Jaabiree, and others. All of them said that this fighting is considered as fighting of tribulation (fitnah). So it is obligatory to stay away from it. And Allaah, the Majestic and Most High, is supplicated to, that he removes this affliction and harm. As for these others [who call to fitnah], then they gather the wealth of the people, they consume and eat and drink – and they have made a business for themselves from this fitnah. So we have millions of people who have been displaced and are living under tents dying from hunger and illness and so on, even children, infants, women, men, the incapacitated – and how many women stay in those camps without any male relatives (mahram) with them, nor family members? So what is the cause of this, may Allaah bless you? So this is what we believe and take as our Religion before Allaah, and that it is not permitted to travel to that land [of Syria]. Rather, instead, Allaah is beseeched in supplication that He remove the afflictions and harms that have befallen them. And if you are to do something to aid them, then give in charity to official governmental bodies, not to people who collect money in streets and at the doors of mosques, do not give them your wealth at all. Charity for the refugees, the poor, the impoverished and those who have been afflicted from those who live in these refugee camps must be given to the official governmental bodies if you wish to aid and help those afflicted. So there are official trusted governmental bodies run by the government. So if you wish to give, then give to them. Do not give your wealth to any old person, here and there, ever. They will take your wealth for use in personal trade and to harm the people of Islaam and some declare the people of Islaam to be unbelievers.